Disclosure: Post-it Brand and Scotch Brand provided me with product and compensation for this post. I reviewed the products before accepting the offer to make sure the product line was something I would use in my own home and could authentically recommend and share with my readers. Reminder Tags. Okay, check this out. These little reminder tags have adhesive on one end so you can loop a note around handbags, backpacks or straps. Such a great idea and they come in four yummy colors – Aqua Wave, Butternut , Chartreuse and Desert Sun, which means you’re sure to see your reminders. Can you imagine the possibilities? They’re the perfect addition to your bag of organizing tricks once school starts. Here’s why: One of the toughest parts about back to school is getting into the new routines and establishing new habits. So, before routines like “take gym shoes on Tuesday” become second-nature, you can stick little reminder tags to your child’s backpack so he remembers his shoes on the right morning. These are the perfect solution for anytime someone says “would you remind me to….” which happens a lot around my home. Such a simple idea and great colors make it fun. Post-it Dry Erase Planner. 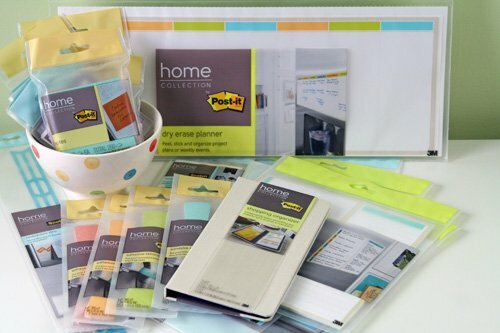 The Home Collection includes a peel and stick planner which would be perfect for recording the new back to school schedule and posting it where everyone can see it. (Those gym shoes don’t have a chance at being forgotten this year!) The planner sticks to practically any surface, yet removes easily. This means you can put it anywhere—on the refrigerator, pantry door, a wall in the mudroom, or on the back of a kitchen cabinet. If you don’t have back to school schedules to worry about, you could use this versatile planner for weekly meal plan or to put together a cleaning schedule. Or, how about using it in a school locker for recording the new class schedule? Scotch Display Frames. For those of you with younger kids, back to school means back to oodles and oodles of artwork. When my kids were younger they were so proud of those masterpieces they brought home nearly every day. They wanted to hang them up for display. I wish there were frames like these when my kids were little. The 9 ½” X 12” size is perfect for the 8-1/2” x 11” artwork heading your way. The frames hang up with removable mounting squares, which means you can set up a little gallery just about anywhere without having to worry about damaging the wall with nail holes. Now here’s the best part. The frames are held closed with repositionable adhesive, which means it’s easy to swap in a new piece of artwork for display as soon as it arrives home in the backpack. Gotta’ love that. Now even though our days of prolific art creation are over, there are still lots of ways to use these frames. I’m thinking about letting my daughter use some of these in her room to hang photos of herself and her friends on the wall. This would be a terrific way to highlight special photos and memories and again, they’re super easy to change out as new memories are created and new photos are printed. The 5” x 7” size frame is perfect for 4” x 6” photos. The Home Collection also includes two more options for hanging items like photos, artwork, cards, and reminders, on walls, kitchen cabinets, the refrigerator or windows. Restickable designs include Cut Tape, Circles and Squares, and a Restickable Display Strip. My son has a couple of sports ribbons he has been wanting to hang on his wall, and I think the Restickable Display Strip will be just right. And for the rest of the collection of photos in my daughter’s room, I think we’ll be upgrading from rolled painters tape, to Restickable Circles and Tape. Post-it View and Go Pockets. Another really cool item in my box of happy mail was a clear pocket with Post-it foam tape backing. This product is designed to stick on a refrigerator, cabinet door, pantry door or on a wall. You can use it to collect papers like recipes for this week’s meals, coupons, receipts, forms to fill out and take with you, or bills. But since it is made with repositionable adhesive, you can remove the pocket from the wall, use the Post it foam tape to close up the pocket, and take your papers with you. This is great for school registration forms, or for coupons, or for paperwork you need to fill out and take to the doctor. Post-it Planner and Perforated List Pad. Before kids, I really used to love shopping. Now? Not so much. Because of this I try to be super organized for shopping. Enter the Post-it Planner and Perforated List Pad. 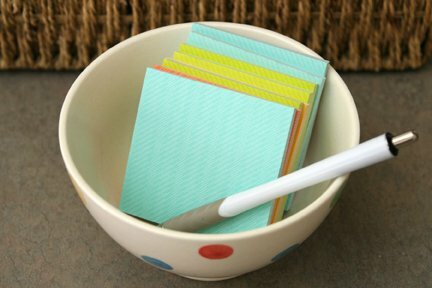 This is the perfect way to organize your weekly meal plans and grocery shopping. On the left is a color coded area with seven sections where you can jot down your weekly menu. Then, on the right is a place to make your grocery list. The best part is, since it is perforated, you can tear off your grocery list and leave your meal plan at home so it doesn’t get lost in transit. Post-it Notes and Post-it Dry Erase Message Center. The last two items in my happy mail were a stash of Post-it Notes in the Home Collection’s yummy colors, and a Dry Erase Message Center. The Dry Erase Message Center is peel and stick, so like many of these products, you can use hang it anywhere that makes sense – in sight or easily in sight with the opening of a door. I could see setting up a really cute message and communication center using these products. Do you have some organizing projects in the works due to back-to-school? Can you see ways to use these products to solve some of your organizing dilemmas? I’d love to hear your ideas in the comments. And be sure to check back in a couple of weeks when I’ll reveal how I put some of these products to use in a creative organizing project. Super cute products! I am loving the colors. I love the reminder tags. I like the reminder tags too! What a fun mail day! Wow, I have never seen these and they all look so good but I am particularly enamoured with the reminder tags. That is genius!! I have lost so many post it notes that I have tried to stick to my bag or someone’s coat or things like that. I have a gift card for the Container Store so will definitely be checking out this range when I go to spend it! I’m so glad to have found your blog. I wondered if the ‘The Home Collection’ from Post-it & Scotch Brand can be purchased at Office supply companies? or do we only purchase through The Container Store?